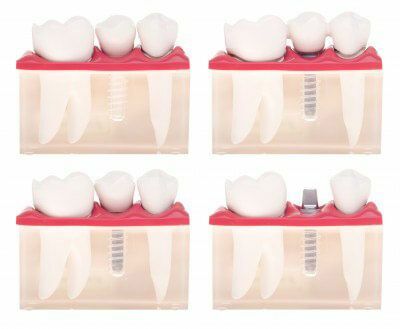 Dental implants are stable, effective, and durable anchors designed to replace the root of an absent tooth. The implants form the base for removable or fixed prostheses to restore function, comfort, and aesthetics. Dental implants are made of titanium and are therefore biocompatible. The procedure is painless under local anesthesia. To receive a dental implant, certain prerequisites must be taken into account. Firstly, the characteristics of the jaw bone are of paramount importance in performing a dental implantation, since it must be sufficiently developed for the implant to be properly supported. Our professionals will also have to ensure that your gums are healthy to permanently anchor the dental implant. After they have determined that you have good general and oral health, they can begin the implant process. To begin, our professionals will do a complete examination of the mouth, focusing on the teeth and the jaw. Afterwards, they will perform surgery and insert the implant. Following the healing of the gums, one of our experts will be able to connect the dental prosthesis to the implant placed previously to replace your tooth’s natural environment. The replacement teeth, or prosthesis, will be made to measure per your oral characteristics with regards to appearance and personal comfort. The implantation of a replacement tooth is a common treatment in the dental field and our dentists will answer any questions you may have. Do not hesitate to ask for more information; they will be happy to help and reassure you! if you think you need a dental implant.